As a student on the New Year retreat you will participate in a living process which gives you the opportunity to discover new dimensions in yourself. The retreat is a process in which all aspects are equally important. Only participate in the retreat if you are prepared to follow the whole retreat. 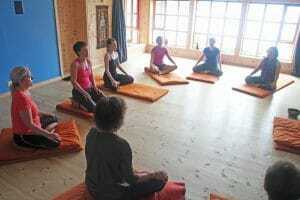 Everybody is welcome to join the retreat as it is designed for both the beginner and the more advanced student. You will learn two different meditation techniques on the Easter Course: The Source of Energy and Inner Silence. 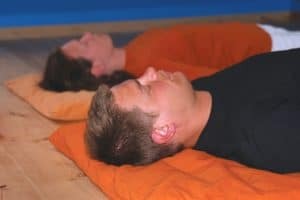 The Source of Energy meditation cleanses and clear up in in the body and mind by using a peculiar breathing technique and concentration on the chakras. Energy stored in tensions and an unclear state of mind are released and transformed into a state of resting calm and spaciousness. You learn a lot on the course – but not everything takes place in the yoga hall. Your body must be able to transform the energy you acquire from the practices. An important experience in the process is your participation in the tasks around the Course Centre: in the garden; preparing food; dishwashing and cleaning or perhaps doing repairs on a house or moving some stones. Cancelling your booking: Cancellation must be done in writing either per mail or email. When cancelling later than 1 month before the course you will have to pay NOK 750. Later than 14 days NOK 1.200 and later than 1 week before NOK 1.800. If you cancel the booking after the start of the retreat you will have to pay full price. Cancellation due to illness: Attach medical certificate or doctors statement which verifies your illness, and you don’t have to pay for the retreat. Just click the Quickview button for direct enrollment or click the image above and you go to the more detailed enrollment page. We accept secure payment with VISA and MASTER credit card. After enrolling we will email you a confirmation with further information on how to get here by car or bus from Bergen. Times: The retreat starts Saturday evening December 29 at 6.30 pm. and ends Tuesday, January 1 at 1 pm. The retreat is intensive – but you still have time to enjoy the countryside, go for a walk, reading, etc. 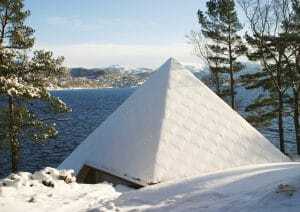 The retreat costs NOK 4.320 and includes teaching, board (vegetarian food) & lodging. Single room can be booked at an additional cost of NOK 330 per night. As there is a limited number (and they get booked early) please contact us per email for further information.